SAT Testing: As per usual, Dogwood falls on a SAT testing date (which is why the meet starts later on Saturday), BUT please let your kids know early on that they can register to take the test in Charlottesville. That way, they can still compete in the meet! If any of your questions aren't answered by the below information, email Meet Management at DogwoodTrackClassic@gmail.com. Timing: Although we have had great success with Flash Results the last several years, they were unavailable for 2019 BUT FEAR NOT, as Doug Thomasey and Blue Ridge Timing are stepping into the void! Fully equipped to deliver the same capabilities of Flash, Blue Ridge Timing will give us the same high quality, instantaneous results we're used to getting. In addition to providing live online results throughout the meet, they also provide two large scoreboards at the start/finish line that will display start lists, a running time clock, wind readings and instant event results. Since we will also have cameras at the 100 AND 200 meter start line, we will have the ability to run the 100 meter, the 100/110 high hurdles, and the 200 (new in 2019) backwards depending on the wind direction. Blue Ridge Timing also gives exact FAT relay splits, as well as 400m splits for all the distance races, just like Flash has done in year's past. Note that 100 dash & 100/110 hurdle prelims will be before the 4x800 relays with one section finals immediately following the 4x800s. Friday Night 3200s: We will once again host these FREE 3200 "unseeded" sections of the 3200 on Friday evening. Like last year, there are no caps on # of entries just so long as each athlete has met the following time standard. These will be timed with Blue Ridge Timing just like the rest of the events. Sanction: Meet will be sanctioned by the state association VHSL as well as for California, Connecticut, District of Columbia, Kentucky, Maine, Massachusetts, New Jersey, New York, North Carolina, Pennsylvania, Tennessee (with others to be added potentially). Meet will not be sanctioned for Maryland public schools as we want to allow category 3 private schools from Virginia to compete in the meet. Maryland private schools CAN compete though. If you are from a state not listed above, please email us to discuss sanctioning. Online Entry System: Meet entries will be done online through MileSplit registration system. Coaches need to claim themselves as team admins on their team pages on the MileSplit network in order to have access to do their entries. All entries must be done online. No exceptions. Entry Deadline: Entries will close online at NOON on Sunday, April 28th. Eighth Graders: Since the meet is sanctioned by the VHSL, only athletes in grades 9-12 will be allowed to compete. No exceptions! Entry Marks: All individual entry times and marks must be verified and in the Milestat database. We will accept times/marks from the last two years (Indoor 2017-2018, Outdoor 2018, Indoor 2018-2019 and Outdoor 2019). We made this big change in 2018 and felt like it a) shortened the meet almost 90 minutes and b) made the meet more manageable for everyone involved. Like last year, there are caps on the # of entrants and heats in each event. In parentheses, we have listed our best guess at what the cutoff for each event will be (mostly based on last year's results) to give you a rough idea of what to expect. Again this year, we will accept the top "X" amount of kids in each event, regardless of their school. Each event has a different # of max competitors based on the # of sections we are going to run off. For example, in the boy's 1600, there will be 5 sections with 90 athletes total. So the top 90 times entered (marks must be verified on the Milestat database) will be accepted and entered into the meet. We have included our best guess estimate (NOT auto qualifying standards) of what that event cutoff is going to be based on last year's results and this year's expectations. We have listed each estimate below. Entries are due at NOON on Sunday, April 28th. We will release the list of everyone who qualified that same evening by MIDNIGHT so that you know exactly who will be competing. This should only be an issue for kids "on the bubble", but hopefully the guideline event estimates help you with your entry planning. And remember, as an option for all your distance runners who didn't make the cut, there will be an open 3200 (free of charge) on Friday evening after the 2K steeples.There will be no entry fee for this section and it's open to any/all of your kids as long as they are sub-11:45 for boys and sub-14:15 for girls. Nothing like a fun, fast open 3200 under the lights! To enter, just do it the normal way on Milestat and the top 90 boys and top 90 girls will go into the "fast" Saturday evening section, while #s 91 on up will automatically be entered into this one. Please note that this event will still be timed and posted on Milestat so that the marks can be used for postseason purposes. Entry Fees: Please note that entry fees will be determined according to the accepted entry list released Sunday evening, regardless of scratches. So if an athlete is accepted into three different events, but ends up scratching two of those, they would still be charged the full $30. Any accepted entries will be billed, regardless of whether that athlete, relay, or team competes. Please keep this in mind as you contemplate attending Dogwood next weekend; once entries close on Sunday morning, we will begin calculating bills for each team and your program will be responsible for bringing a check with you or mailing one if not attending. (New in 2019) Max Entry Fee: $500 for a team. This counts for combined boys/girls programs, and is a result of having multiple teams go well over $500 last year. If an individual competes in four different events, he/she would cost $40 (and not just $10). We will run rain or shine. There will be no refunds. LJ - 19'10"/15'9" (50 athletes per gender, 4 flights). Top 9 to finals. TJ - 39'6"/32'0" (50 athletes per gender, 4 flights). Top 9 to finals. Shot - 40'0"/29'0" (50 athletes per gender, 4 flights). Top 9 to finals. DT - 116'/84' (50 athletes per gender, 4 flights). Top 9 to finals. Awards: Just like the last several years, we will forgo medals BUT instead will give out Asics goods to the top three individuals and top two relay teams in each event. The boy's and girl's team champions will both receive trophies as well. Parking: Parking will be available for free on both days in the UHall lot directly across from the track. Admission Fee: $5 per person on Saturday. Free to children under 10. Friday's events will be Free. Athlete/Coach Entrance: All athletes and coaches will enter the facility through the side gate near the shed and the top of the homestretch. Athletes will need a number to get into the gate and coaches will need to display their coach's pass. The front gate will not be available to athletes and coaches, only spectators. Packet Pick-Up: Coaches can pick up their packets at the table inside the front gate. Lane Preference: For distance events with waterfall starts, we will seed best to worst from outside to inside lanes. Heat/Flight Order: All running events will have the heats go fast to slow. All field events will be the opposite, with the highest seeded flights going last. Attempts in Field Events: Athletes in each preliminary flight of the long jump, triple jump, shot put, and discus will be given three attempts. Note that if an athlete fouls all three attempts, they will NOT be given another attempt. The top 9 overall from all flights will then advance onto the finals with 3 more attempts. Minimum Marks in Field Events: Unlike in year's past, there will be no minimum marks in the throws or horizontal jumps. 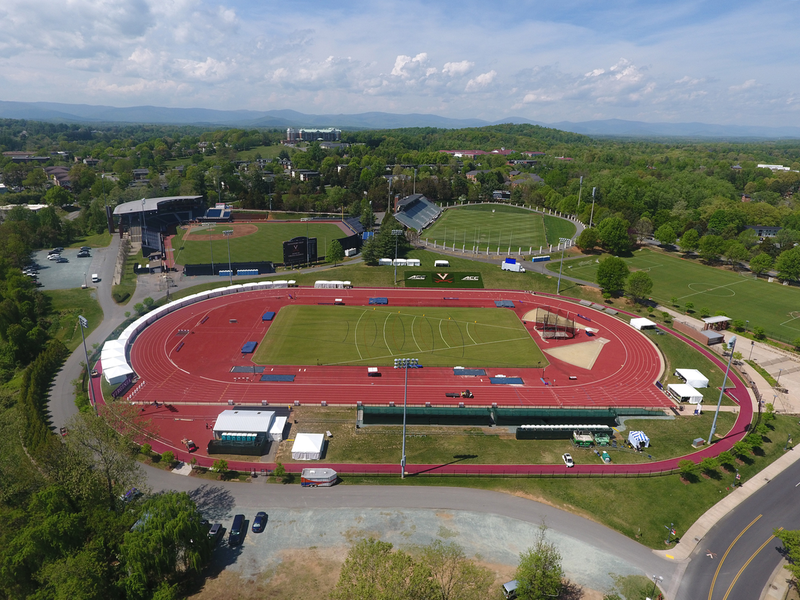 Infield Access: No coaches or athletes will be permitted on the infield area on Friday or Saturday at Lannigan Field and will be grounds for disqualification. We will strictly enforce this on Saturday at Lannigan Field as UVa wants to protect their grass infield area for other events. No electronic devices (cell phones, iPods, CD/MP3 players, etc) are allowed in the competition area. This rule is in place for your and others safety. T-Shirts & Concession: Both T-shirts and concession stand vendors will be on-site to sell meet apparel and food on BOTH Friday & Saturday.